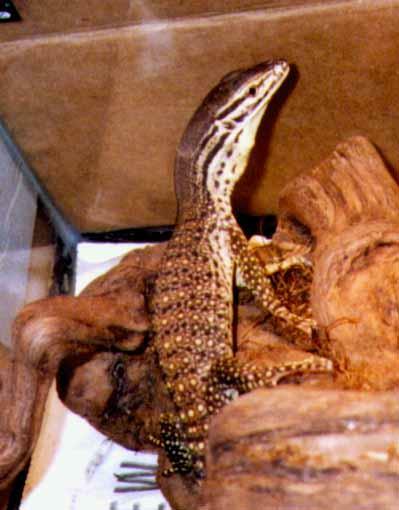 In Seattle, I long though of acquiring more argus monitors. Finally, I decided to go ahead and get some. From a dealer named Rod Mitchel, I purchased three hatchlings produced by a breeder named Patrick Neighbors in Illinois. 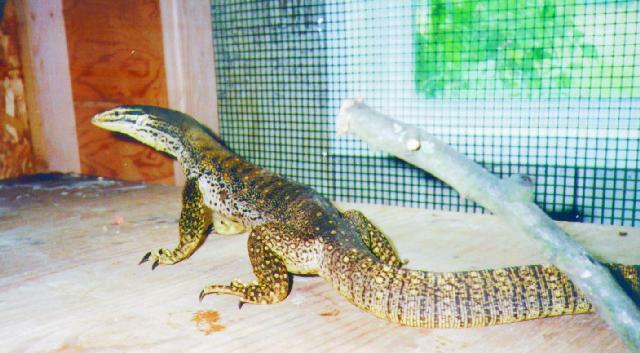 These were set up in a 60 gallon aquarium with newspaper substrate and a large water dish. I did not name them at first, since I wanted to see which ones were males and which were females, and when they are young that is impossible. The youngsters displayed the typical high strung, hyperactive argus personality from the start. They were always cruising about the cage, and the moment they saw you, they would put on a threat display. After waiting for them to get settled in and start eating, I began to try to tame them by handling them a little each day. This didn't seem to have any effect, although it didn't seem to overly stress them, either. One day, when I was cleaning their water, a tragedy occured. I gave them water in a large cat litter box, so that they would have enough room to swim around. When filled with water, however, it was quite heavy compared to a very young argus. When I was out changing the water, one of the youngsters burrowed under the newspaper where the water dish went. I put the dish down on top of him without knowing he was there. I found him the next day with his head crushed. The other two arguses grew up fine, however. I watched as they became magnificant adult animals. One, that I thought might be male, I named Christian, the Science Monitor. The other I named Super-K after the super-kamiokande neutrino detector. In time, it turned out I was wrong about their sexes. Christian was female, and Super-K was male. By about a year, the regular handling was beginning to pay off. They were becoming less defensive around people, although they were still squirmy and highly strung. When she was not quite one year old, I noticed Chris was starting to get a bloated look. I took her to the vet to see if there was a problem. They x-rayed her and found out what was wrong. Chris had eggs! Over the next several weeks, she enlarged, and finally she stopped eating. She began scratching around everywhere, looking for a place to lay. I prepared a nest box by drilling a hole in a ten gallon rubbermaid tote box big enough for a gravid female argus monitor to get through, filled it with damp green potting moss, and put the lid on. She quickly found this, and spent the next couple days digging around in the moss. A week after she stopped eating, she layed six eggs in the nest box, expertly hidden under the moss. I immediately took them out and put them in an incubator, but they turned out to be infertile. Since then, she has layed several more cluthces, none of which have been fertile. 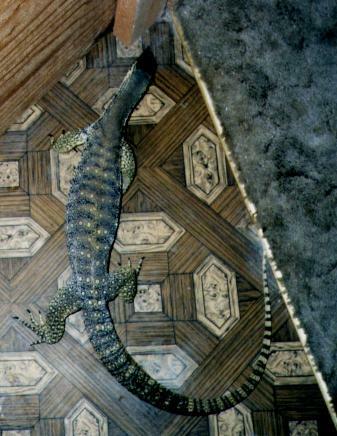 Since acquiring Hall, however, I am hoping that her next clutch will hatch out into healthy baby argus monitors. At a little more than a year of age, Super-K started coughing. Worried, I took him to the vet. Nothing wrong was found, but he was put on a series of injections of an antibiotic. A week after I first noticed his symptoms, he was dead. I was devastated. He had become quite dear to me. I took him in for an autopsy. They found that he was otherwise healthy but had died of acute pneumonia, possibly viral in origin. Chris is still around, though, amusing me with her antics. She has the run of the living room in my appartment, which she shares with Hall, my big male. When she is not climbing the furnature or exploring every nook and cranny, she is usually basking under the various basking spots I have set up about my place. She once had a brush with a disease that looked, at first, like the same thing that killed Super-K, but she came through it without a problem. 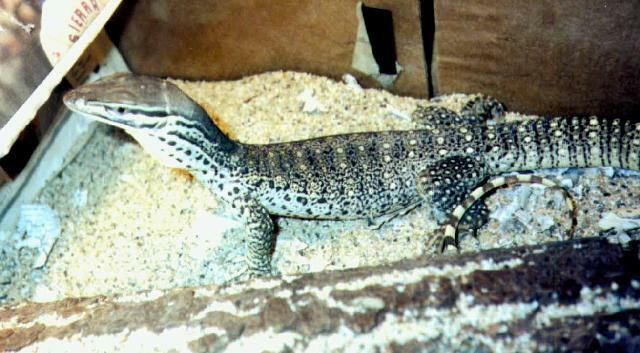 With any luck, she has a long life ahead of her, and will be the mother of many more argus monitors. Updatate: Jan 28, 1999. Chris has recently been off feed and scratching around dark corners of the house. 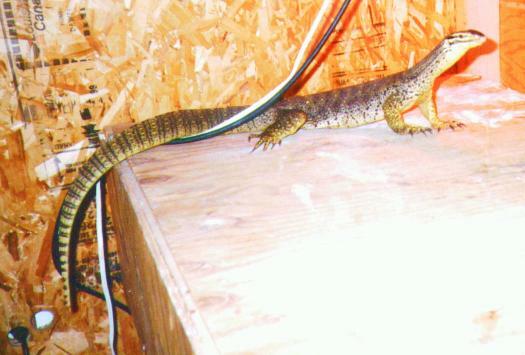 This is a good indication that she is gravid, so I prepared a nest box for her. She entered it immediately after I showed it to her, and she has been digging in it for the last several days. This morning, I lifted up the top of the nest box to check for eggs, and Chris was laying there on top of several eggs! So as not to disturb her, I closed the lid immediately. When I return from work, I shall take the eggs out and put them in an incubator. Feb 5, 1999. Chris layed five eggs. Two of them quickly got moldy, so they were probably not fertile. As for the others, I'll just have to wait and see. If they are fertile, they should hatch in six to nine months. Feb 22, 1999. Chris's eggs have all shriveled up. I suppose they were never fertile. April 27, 1999. I recently moved out of my old appartment in Seattle for a house in Montlake Terrace. There, I built large cages, approx. 2.4 meters by 1.2 meters by 2 meters high for the arguses. Chris and Hall get one cage, Oz and Merrimac the other. All the monitors are adjusting well, Chris seems as inquisitive and active as ever. At the old apartment, Chris layed another clutch of eggs. 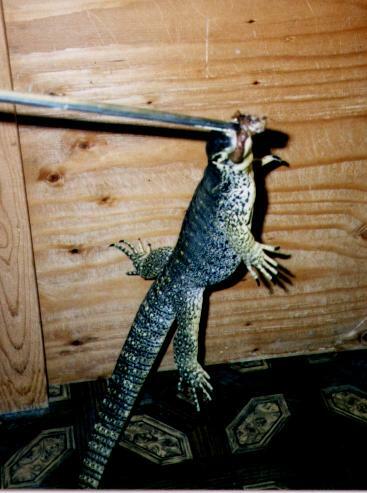 Fed up with all the eggs shriveling up in the incubator, I decided to try another method. I just left the eggs in the nest box. I figure that the moss is slightly damp, about as damp as you would expect soil to be, and the temperature of eggs incubating in the wild is not held exactly constant, so they should do fine where they were laid. Time will tell if this method works or not, certainly the old method did not. I figure I have nothing to loose. May 14, 1999. 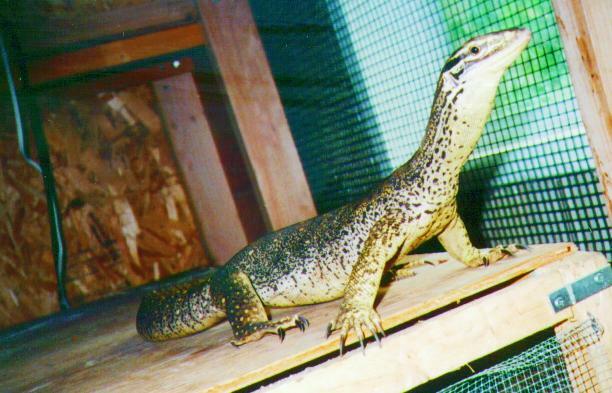 Female monitors seem to be able to recognize their own eggs over those of others. Chris will visit the nest box containing her own eggs and just scratch around, seemingly making sure they are okay. She once got into Oz's nest box, though, and immediately dug up one of Oz's eggs and began to eat it. Chris does not get to play near the nest boxes any more. April 19, 2001. Sadly, Chris died today, at the age of 4 years, five months. After getting the bloodwork from the vet, it is pretty clear she died of kidney failure. Unfortunately, many of the symptoms of renal failure are similar to the normal signs of a gravid female. Chris's genes live on in her ten offspring, and her spirit lives on in my memories. Rest in peace, Chris. Here are some pictures of Chris and Super-K as youngsters. They were virtually impossible to tell apart at this time, so I don't know which is which. Chris gets some air time leaping for a chicken gizzard. 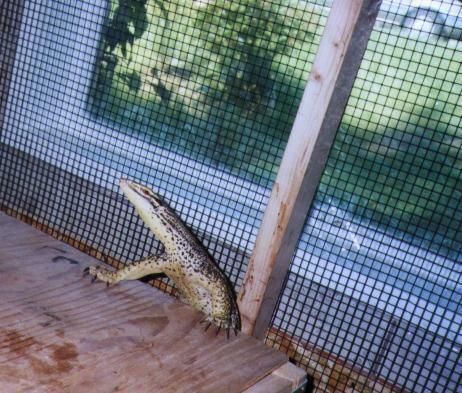 Chris climbs up the basking light table in her cage. Chris basks for a moment under one of the supplemental heat lamps in her cage.